10 امور لا تعرفها عن رمضان بالانجليزية – Things you didn’t know about Ramadan : مع اقتراب شهر رمضان الفضيل، اخترنا لكم اليوم من ضمن سلسلة المقالات باللغة الانجليزية التي تستهدف تطوير مقدراتكم اللغوية باللغة الانجليزية من حيث تطوير مقدرة الفهم والاستيعاب باللغة الانجليزية لديكم اضافة الى زيادة رصيد الكلمات الانجليزية في معجمكم اللغوي بما يمهد الطريق امامكم ويسهلها نحو تعلم اللغة الانجليزية بسهولة. موضوعنا اليوم يدور حول عدة أمور لا نعرفها او لا ندركها جيداً حول شهر رمضان بالانجليزية ، حيث سنسلط به الضوء على بعض العادات الخاطئة والامور التي نجهلها عن رمضان بالانجليزية . ندعوكم للاستفادة من هذا الموضوع على الصعيد الديني، اضافة الى دعوتنا اياكم بفهم الموضوع ومحاولة تدارس المعاني الانجليزية الهامة التي يحتويها والاستفادة المطلقة منها لغايات تطوير مقدراتكم في اللغة الانجليزية. 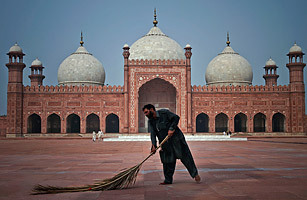 … It’s “no drinking” too: Muslims drink not even a drop of water from dawn to dusk. In addition to not eating or drinking anything all day, they also abstain from excesses like cigarettes… Yet despite the fasting, ramadan in most Muslim countries is an interesting mix of austerity and celebration. While they abstain from many things during the day, after sunset families and friends often visit with one other, filling the streets of major cities with food and laughter until the wee hours. A date is traditionally the first thing eaten to break the fast, followed by juice or jallab — a sweet drink made from dates, rose water and carob that is usually served with floating pine nuts and raisins. 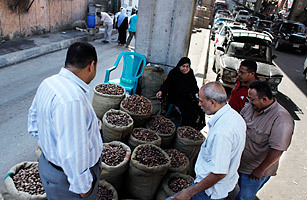 In Egypt, dates, a traditional Ramadan food, are harvested in different farms and oases across the country, as well as imported from North Africa and the Arabian Gulf states. The best dates are often given catchy names by their vendors to help market them. In 2006, after Israel’s war against Lebanon, the best dates were called Hassan Nasrallah, after the leader of Lebanon’s Hizballah. In 2009, after the U.S. President made a visit to Cairo, the best dates were called Obama. This year, the most prized dates are called Martyrs of the Revolution. Tahrir Square is another favorite. Religious baby names aren’t unusual across any faith; however, when devout Catholics choose to reflect their faith in their child’s name, they often go the way of a saint, like Mary, or the way of a virtue, like Grace. You’d be hard-pressed to find a baby named Lent. Not the case with Ramadan, as the religious observance has also become a common name for Muslim baby boys. While the name was a more popular choice in the ’90s than it is now, Ramadan could be making a comeback. According to the website BabyCenter, the name’s popularity has been steadily climbing since 2005. 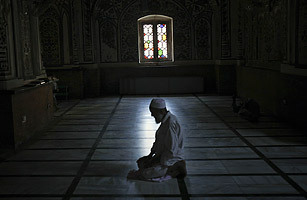 The holy month of Ramadan requires Muslims abstain from eating and drinking from sunrise to sunset each day. For the most part, that is considered an unbreakable rule. However, there are some instances in which one may take leave of the fast. According to the holy Koran, people who are sick, elderly, traveling, pregnant or breast-feeding, as well as children under the age of puberty, can forgo fasting if it will negatively affect their health. Additionally, a fast can become invalidated for reasons such as menstruation or postpartum bleeding, intentional vomiting and, of course, breaking a fast to eat or drink. 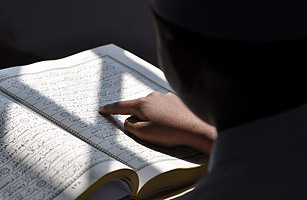 In all these cases, the Koran requires that believers take a qada fast — meaning to fast one day for one day — to make up for the missed days of fasting, as soon as possible. 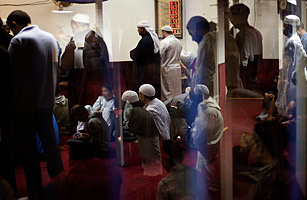 Ramadan is a keenly anticipated, prime-time TV season. Arabic, and increasingly Turkish, production houses work around the year to create 30-episode miniseries — one for each night of the month — in the hopes of snagging viewers, advertising dollars and the opportunity to boast that their series was the most popular. However, this year things aren’t as good. According to a Saudi newspaper, al-Riyadh, production is down 35% thanks to the turmoil of the Arab Spring. Fasting has been around much, much longer than Islam. Indeed, mentions of abstention from food and drink can be found in the Hebrew Bible and the New Testament, both of which predate the Prophet Muhammad (who was born in A.D. 570). In one case found in the Bible, Queen Esther asks the Jews to fast for three days before she visits her husband, the king, to ask him not to kill them. And in the New Testament, Jesus fasts in the desert for 40 days, which is why to this day certain Christian denominations observe Lenten fasts. The fasting itself is also different in Ramadan in that Muslim observers can technically eat each day, they just can’t consume anything during daylight hours. Despite the daily fasting, Ramadan is notorious for being a month of weight gain. There are many reasons why practicing Muslims often gain, instead of lose, weight during this time. Foremost is that fasting and low activity levels during the day often give way to binge eating at night. Such behavior results in slower metabolic cycles that cause the body to store fat instead of burning it. Additionally, iftar meals — the evening meal served when Muslims break the fast — are traditionally heavy, high in carbohydrates and lacking in nutritional sustenance. In order to maintain a healthy weight throughout the month, Muslims are encouraged to drink plenty of water, eat a diet full of fruits, vegetables and protein, and wake up every morning for the suhoor meal, which occurs before sunrise. Donations to charities see a significant rise during the month of Ramadan, as many Muslims choose to give their charity for the year during the holy month. 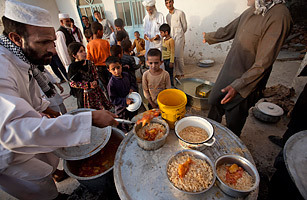 Mosques and religious organizations offer free iftar meals to the poor every evening. It’s also common for wealthier Muslims to give poor families Ramadan bags or baskets containing basic cooking items like sugar, oil, rice and tea before the first day of the month.